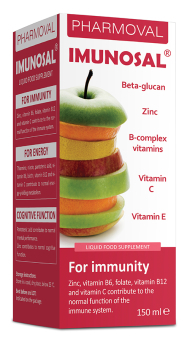 Imunosal® liquid food supplement with beta-glucan, 10 vitamins and zinc for children over 1 and adults. Children ages 1 to 3: 1 teaspoon (5 ml) daily. Children ages 3 to 12: 2 teaspoons (10 ml) daily. Children over 12 and adults: 1 spoon (15ml) daily. Take with meals. Shake well before use. Once opened use within 2 months. Consult your pediatrician if using Imunosal liquid food supplement in children ages 1 to 3. 1) Zinc, vitamin B6, folate, vitamin B12 and vitamin C contribute to the normal function of the immune system. 2) Pantothenic acid contributes to normal mental performance. 3) Zinc contributes to normal congitive function. 4) Thiamine, niacin, pantothenic acid, vitamin B6, biotin, vitamin B12 and vitamin C contribute to normal energy-yielding metabolism. 5) Thiamine, riboflavin, niacin, vitamin B6, biotin, vitamin B12 and vitamin C contribute to normal functioning of the nervous system. 6) Riboflavin, niacin, pantothenic acid, vitamin B6, folate, vitamin B12 and vitamin C contribute to the reduction of tiredness and fatigue.